I was going to share a recipe for Dambu Nama(shredded beef suya); then this happened. My son has been loving okra since he got diagnosed with some food allergies. Not only is it safer for soups, but it’s super healthy and great for his skin and other functions. I have never cooked so much okra in my entire life. I remember my dad made it everyday and later left me the duty to make it for him before he passed on(God rest his soul), but this one is like every day and some and it has to be a different recipe each time. Nigerian recipes don’t have to remain redundant you know! It’s very tough being an adult. This adult life is no joke. I always tell children and teenagers who cannot wait to grow up; to enjoy their life as children. There is nothing there oh! Stop rushing to grow up. Stop wishing you were somebody else. You never know what that person is going through. Be your own unique you. Enjoy each phase of your life, savor each moment, savor every age and time you find yourself, enjoy what you do, find your passion and have no regrets. Even though some things that happen to us in life are never planned, we never leave any situation without a lesson. 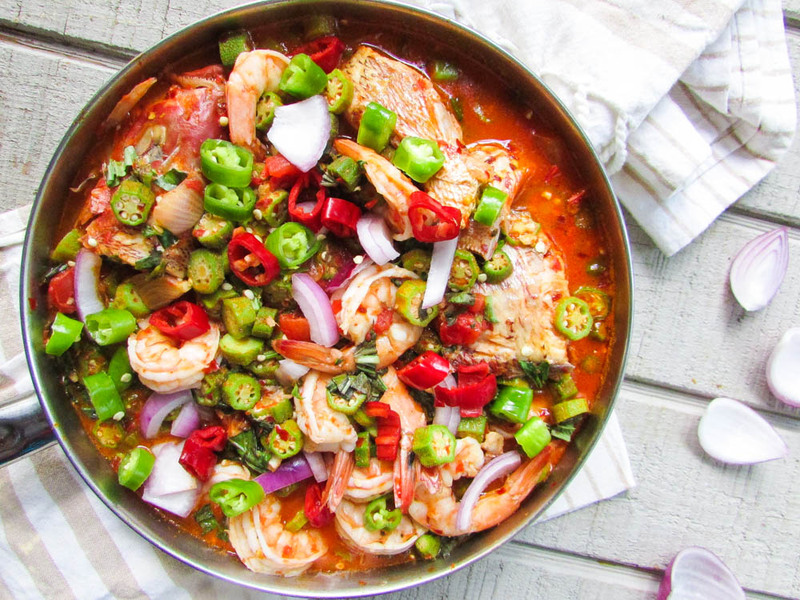 Anyway back to the Okra…For this recipe, I did not use the traditional gumbo recipe. In fact. I didn’t even Google it. I just remembered knowing what Gumbo looked like and what I wanted to achieve. I knew inside of me that it would be more than just using Nigerian spices and I had to do something more than a fusion. I made a whole sauce pan and everything was gone that same evening. One thing I like about this recipe is the fact that the okra remained crunchy. There is nothing as painful as eating soft gooey okra…oh my days! Don’t even! While this recipe is great to quench hunger, It is great for those on a healthy diet and those who are on the #fitfam drive. I didn’t set out to really do a #fitfam recipe; healthy? yes…the fitness bit is just a wonderful plus. Heat the coconut oil in a cooking pot. Add the shrimp and let it cook on both sides until pink. Transfer the shrimp into a bowl; then add the onion and sauté until translucent. Add the garlic and sauté until fragrant(do not burn). Add the tomato, paprika and ginger. Sauté until the tomatoes have reduced a little. Add the bell pepper mix and cook for about 5 minutes until reduced. Add the fish and meat stock(do not add too much of the stock. Just to where it's a little soupy). cook for about 5 minutes; then check for seasonings(Stir in some salt and bouillon as needed). Add the peppers(ata rodo and chili), and basil. Cook for another 2 minutes. Stir in the shrimp, crayfish and chili powder; then set aside. Serve alone or with fufu or rice. This entry was posted in Eating Healthy, Fish recipes, gluten free nigerian recipes, Healthy Eating, healthy holiday recipes, Healthy Holiday Recipes, Healthy Nigerian, Healthy Nigerian Dishes, Healthy Nigerian recipes, main dishes, main meals, Nigerian sauces, Nigerian soups, Okra recipes, Okra soup, Sauces, sea food, sea food recipes, Seafood, Soups, Uncategorized and tagged Fish and seafood gumbo, Flour free Gumbo recipe, Gluten free gumbo recipe, Gumbo recipe, Gumbo recipes, Nigerian fish and seafood gumbo recipe, Nigerian food blog. 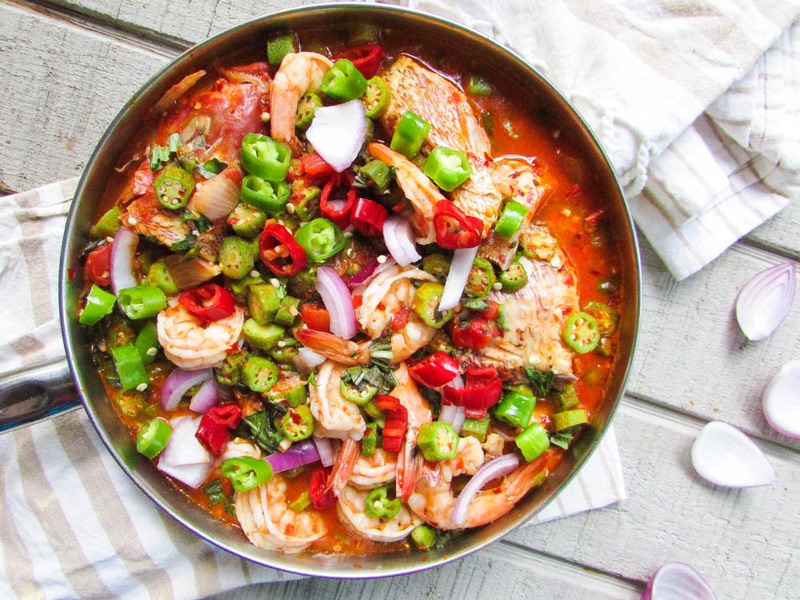 Gumbo fusions, Nigerian gumbo recipe, Nigerian okra recipes, Nigerian seafood gumbo recipe, No flour gumbo recipe, okra recipe, Okra recipes, Okra soup recipe, Okra stew recipe, Seafood gumbo recipe. Yumm….. And quite easy recipe… Well don Nma Jewel! Was hesitant to try this, but glad I did! Tastes great, Nma! “Because Nigerian food can be more”… you said it. The same thinking inspired me to make an inspired Udon soup. ( http://www.saitaku-food.com/workspace/upload-images/recipes/udon-soup.jpg ). I’m not a chef by any means but have been dabbling recently with online recipes… I’ve bookmarked this site… looking forward to trying many of these. Thanks for sharing!